One, I’m not sure what Larry Summers said wrote all those years ago. I read the transcript today and was kind of hoping for something scandalous. Instead, the worst is that, by a back of the envelope estimate, differences in proportions of women in math and science might be due to differences in variability. “I don’t know the answer, but I think that if people want to move the world on this question, they have to be willing to ask the question in ways that could face any possible answer that came out.” – From “Remarks at NBER Conference on Diversifying the Science and Engineering Workforce” Or: How I Learned to Say Quasi-Offensive Things and Lose My Harvard Presidency. *Before I myself become a pariah (not that I’m well-known enough to be one), I want to establish my view of the sentiment of the comic. That is, that group generalizations are made when it comes to women but men are treated as individuals. 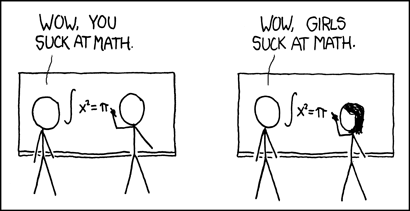 There’s also an undercurrent of truth, dynamically related between the social perception of girls in high school math (the intro calculus in the comic), the reinforcing experiences of seeing mostly boys in math, and so many other things someone should write an essay or a speech about where to begin studying the issue.